Okay… from a Calabrian viewpoint – what is the meaning of life? And yes, I’m being serious. I’m not looking for the “ultimate” answer, just what you think the local answer would be. This is a fabulous question, and first let me preface my answer by saying I certainly don’t presume to speak for all Calabrians, who are a rather varied group despite the basic, deep Calabrese pride that runs throughout the toe of the boot. I live in a hilltop village of about 350 people, most of whom are probably over the age of 65. The houses are built on top of one another, more or less, as space used to be limited; the village used to hold as many as 12,000 people. On the sides of the hill leading up the village, there are many plots of land, most of which are still used as garden spaces or places to keep animals. So for many of these traditional Calabrians, those who still get up at sunrise to feed the hens, pick olives, or till the soil for a new planting of tomatoes, I’d say the meaning of life is rather simple—to wake up relatively healthy each day, strong enough to have the opportunity to take care of whatever needs to be taken care of, whether it be the land, the house, or the family. And when they have a little left over, well it’s time to go off to the neighbor’s house and share. I think that’s what the Calabrians I know are best at doing and what they strive to do each and every day—they do what needs to be done for themselves and their loved ones, and then go one step further and help out friends and neighbors when bounty allows. It seems to me, for many here, immense satisfaction comes from simply knowing they do what they have to do and if they are able to share beyond that, all the better. This allows them to sleep well at night even if their beds creak with every slight movement and are held up by frames tied together by old rags. You’ll perhaps notice I didn’t mention elaborate several course family dinners, which are certainly a big part of southern Italian life. I can’t possibly overstate the importance of fresh, homemade food and wine to the average Calabrian, and of course that’s what a lot of that hard work accomplishes. But I also didn’t talk about sitting back and relaxing with a nice glass of homemade wine while gazing at the sea. Yes, some of that goes on down here, but more by the younger generations; the older generations hardly have time for such frivolous things with all the work they’re always busy doing. Jen, thank you for pushing me to verbalize exactly why I love living here so much. I am so very blessed to live among such wonderful, hard-working, kind people who provide, along with a never-ending supply of figs, lemons, and oranges, constant inspiration to be a better person in ways that truly matter. This is beautiful. A beautiful way to live. I think this is exactly the kind of thing we’re missing in most of the urban/industrial/working world. To put your very best into each and every day, love, be healthy and give SHOULD be the meaning of life. This is what makes us human and helps us sleep at night. Thank you for sharing this wonderful reminder with us , Michelle. What a tremendous answer to that question. It kind of warmed my heart to read that there are still people like your neighbors left in this modern and plastic World. It’s always good to be reminded of good, isn’t it? This is why I rather hate watching TV news (in any language)…. wonderful question and thoughtful answer, which was a pleasure to read this monday morning! thanks michelle for illustrating your neighbors so beautifully! Isn’t it funny how (even with all our complaining) it takes answering another person’s question to remind us why we are here and why we love it here (when we aren’t hating it that is)? I have asked myself the question “what do they find about their lives that makes them interesting and happy” about many of my husband’s relatives. I wonder if it is genetic. Is it a gene I miss, that of standing still and be pleased where I am, or is it an extra gene that pushes me further, not necessarily better, but further into the stratosphere? I shall probably never know until my days on Earth are over. But I must say, I do admire that devotion to the every day tasks, that reassuring quality of doing the same things week after week and looking forward to them. Whatever you do this week, enjoy! You know as outsiders it’s easier for us to look and analyze these things…and yet the answers don’t always come so easily…. I think in the race for bigger, better, faster we sometimes forget about the meaning of life. nyc/caribbean ragazza’s last blog post..Okibà Mozzarella Bar Comes to Campo de Fiori. I will be sharing this with my Calabrian friends – both here and back home in Canada. And also witha few of my ex-pat friends who have become frustrated with life here in Rome – as we all do every so often. A beautifully written testiment. Grazie tanti. Nice post. You’ve summed up my grandmother who never could sit still and even then was always crocheting or knitting. Must be the Calabrian blood. The Neapolitans (men) at Positano certainly don’t have any qualms about sitting on a low wall watching the world go by. Scintilla’s last blog post..What’s flowering in my garden in Positano. Karen’s last blog post..Viva San Giuseppe! I had no idea how small your town is. Was it hard for you to get used to that sort of lifestyle or was it a welcome change from what you were used to? milanese masala’s last blog post..C’è Crisi??? This is a beautiful post, Michelle. Wonderful thoughts to reflect on as I start off my day here in Massachusetts. Thank you! JenniferRafferty’s last blog post..Calabria-Simu o No Calabrisi? Very nice post, Michelle. Glad to know more about Calabria and their people. Isn’t it funny how it takes a group of people living in a town of 350 people to let us know what’s really important in life? terrific post Michelle. Ciao Michelle! What a beautiful post. You have described so well one of the aspects of Italian life I love and respect the most… that the immense satisfaction of life sometimes comes from the smallest things. Thank you for sharing! How lovely! I think of all of Italy I would most like to live in your village. What strikes me is the simple and old fashioned notion of taking care of yourself and your land, animals, family etc… and with anything left-over, sharing what you have with a neighbor. This is exactly the kind of community I lived in when I was a child, and it is an environment I understand and appreciate. Thank goodness you found it and I am so happy for you! Michelle this is an evocative post that was enjoyable to read- and oh how I love the photos! lovely post. i want to go there even more now. What a wonderful question and answer. I so enjoyed this article . Makes me want to be there even more than before. Lovely piece and I am so jealous of your lifestyle. Your photographs are terrific, too. Sounds like a perfect place for a writer’s retreat. I so need to get my book finished. You are creating a wonderful life for yourself. Thanks for sharing. Michelle, you are wise and you have seen a different live to be able to appreciate the live in Badolato. But what about the young Calabrian? Why are they all leaving their villages? They study in Rome and try to find work. Only a few lawyers and doctors have a chance to find work in Calabria. Also the younger generation finds Calabrian live too boring (nightlife wise etc.). Maybe they have to make other experiences before coming back and enjoying the slow and (mostly) peaceful live in Calabria. I think it’s the same in small towns all around the world…I came from a small town in the US that was similar to this but didn’t want to stay there, and now look where I am. I think it’s natural for young people to be curious about other ways to live and opportunities; some will be back and some won’t, depending on how they define the meaning of life, I suppose…. Thank you Michelle for reminding me why I am so proud to be Italian! You really summed up contentment in a nutshell. The *more* we have, the less we have it (contentment, that is)…what a paradox. Oh Goodness. A profound question whose answer breathes simplicity…like the lives you describe. Your story and photo bring back a poignant memory. The woman leaning over the braciere caused a hitch in my heart. 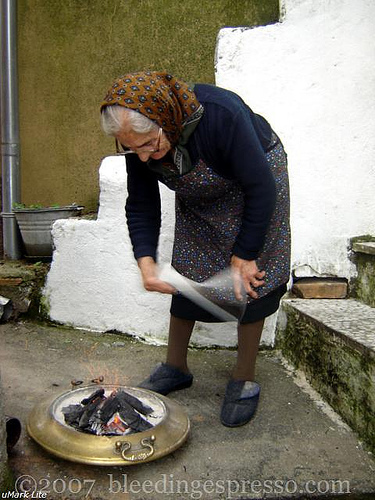 I saw my Zia Raffaela on the dirt floor of her Calabrian kitchen stirring up the coals in the pan. Dinner over, dishes washed in cold water, she gave me the braciere to take upstairs to the one bedroom in her little house. Young American, I was afraid to sleep with burning coals next to my bed; but the next morning I woke safe and warm and amazed at simple comforts. Thank you for taking me back down long ago paths. Loved this Calabrian post. That’s how I grew up in a small US town next door to my Calabrian grandparents, surrounded by their friends and families who had also immigrated from southern Italy in the early 1900’s. Extras from meals, garden produce, and eggs from the chickens (we did not even live on a farm), were always shared. My parents still feed the neighbors with vegetables from their backyard garden. I visited Calabria twice, and it’s so untouched by tourists, that it’s easy to settle into the beauty and traditions of Italy. Thanks so much for your comment, Lenora. Where I grew up in the US was actually quite similar as well, so I’m happy I’ve been able to recreate that to a certain extent. Penso che vivere in un posto del genere (si chiama Badolato, vero?) fa giusto il bene degli scrittori. Purtroppo per far vivere le nuove generazioni ci vogliono attivita’ sociali che esulano dalla felicita’ semplice del buon bicchiere di vino e dall’agreste vita quotidiana. Io parlo da chi ha vissuto fino a 20 anni a Ciro’ Marina, in provincia di Crotone e poi si e’ catapultato nella citta’ a Firenze. Your post is great. It is really what I miss the most about life in Calabria. That way of living that I cannot find anywhere else. Thanks so much, Valentina. Hopefully you get back to Calabria often enough to be able to enjoy it 🙂 Thanks for visiting! What a wonderful answer, the photos are gorgeous! Love this post, Michelle. One of my favorites of yours! Thanks for keeping your sparkling blog so much alive and healthy. .-= Carlo´s last blog ..Undués – Sangüesa Il giorno del caffè =-. Only now do I realize this was an old post of yours. Don’t know how I got here, but it was surely worth reading! Your post brought a huge smile to my face, thank you for revisiting it so I would have the opportunity to read it. I love the Italian “philosophy” of life- most Neopolitans also have this wonderful sense of pride and authentic way of living too, and you can see it once you take the time to get to know them! It has filled my heart and made me remember what the most important things in life truley are… caring, loving and giving. There is not a day that goes by that my wonderful neighbors do not come by with a wonderful dish or something fresh from the garden to share with us! Beautiful Michelle. My father-in-law had a terraced garden in the mountains (now kept by my mother-in-law), and his greatest joy was to share the fruits of his labors- every kind of lettuce, blackberries, strawberries, green beans, wild asparagus, cabbage… you eloquently expressed the importance and value of sharing a genuine meal around the table. One of my sweetest memories is of my father-in-law being the first to show up after the birth of my second son with a bouquet of roses from his garden. .-= Jennifer´s last blog ..the God thing =-. Just wonderful! thank you for sharing this….smiles. .-= Ellen´s last blog ..My girls are going off to college…. =-. 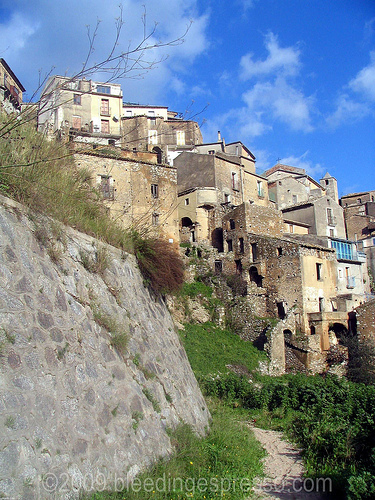 Just discovered your wonderful blog about life in a Calabrian village! Making time for your neighbours…what a wonderful and rewarding way of life… no wonder they sleep well there!! There is so much wisdom and truth in what you wrote. This was my favorite part because my husband’s grandparents have the same lifestyle and I really enjoy being around them. They emit a sort of positive energy that is contagious to the heart!! .-= Elisa_Croatia´s last blog ..It’s been one year…..living overseas =-. Michelle-I’ve read thru your archives and your roots are showing…both Calabrese and Coal Cracker! Your use of pictures of Calabria with pictures of the “strippin’s” really speaks to your heritage. Your recollections of grandparents, Christmas lights, coal bins, cookies and cruising are pages right out of my own Coal Region story. I carried a fist size chunk of anthracite from home through Calabria for two weeks. And before we left, I stopped along the autostrada to toss it into the woods as a symbolic gesture to connect what my late grandfather mined for 43 years to the homeland that he left in 1914. I agree, you would be crazy if you did not bring that mini-bucket of anthracite with you to your new life. Well done! Haha I’ve found it impossible to hide my Coal Region roots — no complaints there 🙂 Love your coal story, Jim! I love everything about this site. All the messages ring so true to my life and understanding of how I felt when I visited my family home village of Serra San Bruno Calabria. Thank you.